Imagine a large leafy square with fountains and huge trees, surrounded on four sides by the colorful arcades of ancient colonial buildings. Imagine the kiss of a chocolate scented breeze on your skin. Imagine a concert band playing a classical concert with elderly couples rising casually from their benches to dance an elegant and sophisticated Danzon. I didnt have to imagine it, because I was in Oaxaca, a state capital city in southern Mexico that is as breathtaking as everyone says it is. Oaxaca is the second poorest state in Mexico but one of the richest in tradition, cuisine, culture, and natural beauty. I could have chosen no better vacation spot for the week I was away from my home in San Miguel de Allende, twelve hours north by bus. Although a large city, it felt small and accessible, and it seemed I could walk anywhere I wanted to go. I did get into a car to visit the ancient ruins of Monte Alban on my second day. I booked a tour through my hotel, but it would have been just as easy to go the 6 km on the public bus. The guide, Guillermo, explained to our little group of four the history, poetry and romance of the sacred historical site from 500 B.C. His English was eloquent and his knowledge of Mexican pre-history vast, as he had studied archaeology and anthropology at the university. I also wanted to visit the Monte Alban City of Death, or Mitla, which was 50 kilometers along the Tehuantepec road, plus some stops at craft villages. So the next day I wandered into a tourist office and talked to Jorge Jimenez Rodriguez about a trip for the following day. Jorge didnt have Guillermos expertise at explaining ancient archeology or even English, but he did have the gift of gab en espagnol. Mitla is an unique archaeological site with Mixtec buildings of great artistic beauty. 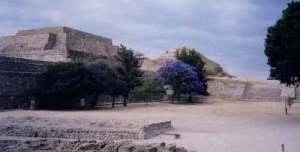 This is where the priests of Monte Alban lived and died, and some of the tombs may be visited. After Mitla, we made an unscheduled stop at a mescal factory by the side of the road, and toured through the many steps from maguey to bottle, I tasted some of every kind. Who knew there was cappuccino and coconut flavored mescal? I bought what tasted the best to me, but also because of the worm in the bottom of the bottle. The various craft villages all specialize, and you can meet and purchase directly from the artisans. San Martin Tilcajete in the Valley of Oaxaca is where you find the woodcarvers whose colorful fantasy animals are famous around the world. At the weaving village, Teotitlan del Valle, the little shops of the many different weaversall women–were set cheek to jowl, meaning you didnt have to cover a lot of territory to do a lot of shopping. I wanted to buy everything just because it all was beautiful, the weavers themselves were so lovely, and the prices after good-natured bargaining, seemed like stealing. One of the weavers I purchased from was a young girl with beautiful braided hair. When I asked her if I could take her picture, she requested copies and I took another picture of her writing down her address in my notebook. She spoke Zapotec, Spanish and English. We also visited the Casa Rosa pottery factory in the village known for its black pottery, San Bartolo Coyotepec, and watched a demonstration by Rosas grandson, himself an old man, who made an exquisite jar of the local black pottery using the ancient Zapotec Wheel, meaning no wheel at all but a saucer turned by one hand as the other shaped the clay. We had lunch in a restaurant near the Tule Tree, a immense cypress supposedly 2,000 years old. Its easy to disparage such a tourist attraction, but actually it was awesome. The entire town of Santa Maria del Tule appeared to have been built around the tree with tourism in mind, with flower beds and elegant walkways. Theres a fence around the tree, so that you must pay the 2 pesos entrance fee to get the closest look at the allegedly biggest tree in the world, at 53 meters around and a little more than 41 meters tall. Thrilled by the gorgeous work of the local artisans I had seen in the villages, I found my way to the Mercado des Artesanias, just a few blocks from my hotel. It was hot and close inside, as well as dark, not like the cheerful outdoor shops in the villages. The wares were superb, and I shopped, but I remain haunted by the sight of a young boy of ten or eleven selling an armload of very wilted white flowers. He had exhaustion in his eyes as he shuffled through the stiffling airless mercado, slumped like an old man. His skin was blotchy with patches of white on his brown face, and his eyes were weary. How I regret not buying his flowers. That night I went to El Sagrario, a three story café-restaurant-pizzeria-nightclub close to the zocalo. Good thing I got there early, because by ten thirty there was standing room only. Two live bands alternated, so there was constant music but little dancing until a group of three young men from Veracruz arrived. Luckily they sat near me, and once the band got their salsa groove, the three of them alternated dancing with me. Soon I was invited to join them at their table, and I thought I had died and gone back to Cuba. Juan Carlos, one of the most handsome men I ever met, danced like a Cuban. Sunday I went to mass at the elegantly rococo Santo Domingo church. The inside is dazzling gold leaf, the outside a gorgeous green limestone. Later that evening I returned for an outdoor chamber music concert by the Mozart String Sextet with the full moon rising behind the church as a backdrop. 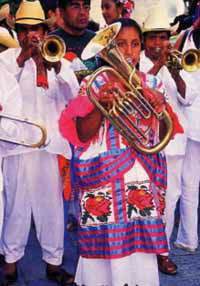 After mass, I headed back to the zocalo for the noon concert of the Oaxaca State Concert Band. I had attended the previous nights concert, and was impressed with the professional sound and lighting, as well as the musicianship and artistry of the performance. A little boy selling Chiclets stops in his tracks, enthralled, a foot away from the first trombone player and appears hypnotized for the length of the piece. Another Chiclets vendor, a middle-aged indigenous woman, stops working the crowd when the band strikes up the Pineapple Dance from the local Gueleguetza folklore, and claps joyously with the music. Everyone jumps to their feet and sings the final piece, Oaxaca Linda, the state anthem, with love and pride. I had never seen such a magical blending of an audience, although I know music does that. I was so filled with joy that after the concert I couldnt do anything but relish it. And so took a table at one of the many zocalo cafes and ordered a cup of chocolate and watched the parade going by my table. Good natured vendors of small wooden toys plied their products to us sitting ducks at the outdoor cafes. To the contrary of being bothered by the vendors, it was a pleasure to sit in that lovely spot and have the wares come to me. And if I refused (how many chicken paddles can you use? ), the sellers continued on with a smile. A beautiful dark and slender young woman balanced a huge basket of red roses on her head as she crossed in front of me like a dancer. A candlelight peace vigil was making a presence in these last days before the Iraqi war. A mandolin quintet, with claves, was singing everyones favorite songs for a price. The many colossal balloon clusters of invisible vendors seemed like eerie, silent witnesses to the life in the plaza. They bobbed, pulsed, breathed, appearing to me like living plastic and mylar beings of great wisdom. Zocalo life could come and go, but the balloons saw it all and werent telling. Returning to my hotel, I glanced into the courtyard of an ancient building and saw dancers moving together without music. Stopping I looked harder because what they were doing reminded me of tango. A closer look told me it was tango, or was supposed to be. Drawn like a magnet, I went in and asked a seated woman if this was a rehearsal for a dance performance. No, it seemed this was a tango class! Well, I said, I am a tourist here, but I am a professional tango dancer. The class came to a sudden halt, and I was swept toward the teacher, a skinny toothless old man. Someone punched play on the boombox, and nothing would do but the old man and I had to dance a tango together for the camcorder! After what was a very painful experience because he hadnt a clue how to dance but must have picked up some choreography from Rudolf Valentino movies, they turned the video camera on me and asked me to dance solo! I danced a solo tango which is now preserved on video in Oaxaca, Mexico! I talked to some of the students, danced with young Alejandro and exchanged email addresses, and I sashayed on my way feeling like a movie star. Sad to be leaving the next morning, and challenged to get all of my purchases packed for the bus, I put off thinking about it and went to an internet ice cream store. I ordered two scoops of nieveZapotec Dreams and Tamarindo with Chileto refresh me as I pounded out descriptive email to my friends who had never had the good fortune to visit Oaxaca. And I stayed for quite a while, having another iceMescal this timeas the internet cost only 8 pesos per hour (about $.75). Maybe Ill postpone my return to San Miguel and go back to that fabulous museum in the Ex-Convento of Santo Domingo, and while Im at it, revisit the Tamayo Museum, too. And since there are seven types of mole and Ive only had two of them, some more meals on the zocalo also seem like a good idea. There is so much to see and doand eat!in Oaxaca.